Besides the human touch and elegance of these beeswax candles, they burn cleanly and have a slight honey aroma that brightens up the room. Maker Alina Bednarz’s decades of high couture experience really shine through in the design. 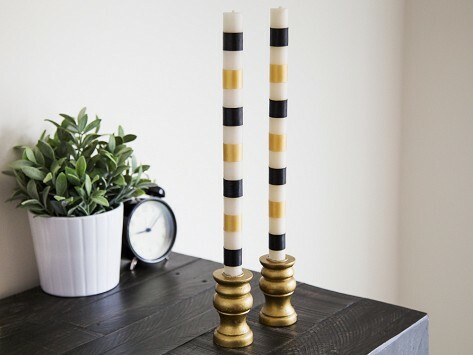 Each luxury candle is braided, twisted, painted, and even studded to a glossy finish by local artisans. Dimensions: 12" x 0.75" x 0.75"
Lovely accent for your home. Some colors were out of stock. Looking forward to more variety! These were a bust. The coloration was not close to the photo presentation and therefore could not be given as a gift. Hand rolled and ornately crafted—each handcrafted beeswax candle from Et Al emits soft light and elegance. To make these clean burning candles look as beautiful as they are practical, Alina Bednarz combined her decades of experience in high couture with the crafting traditions of her native Poland. Alina makes her candles with pure beeswax and 100% cotton wicks, for a long lasting burn that offers a subtle scent of honey. She employs local artisans to handcraft and inlay the candles with semi-precious stones, grains, cutouts, and appliqués. Her company’s name is a nod to those talented craftspeople, because “Et Al” means “and others” in Latin. Wherever you display one of these timeless candles, they’ll add artistry and harmony.